Just How Magic Are Magic Bands? Disney’s Shaking More Pixie Dust on Them Every Day! This post is all about the almighty magic band. I’m learning day by day with each foray into the parks just how powerful these babies are. It seems that Disney is adding more and more functionality to them all the time. They really are something you NEED to have now when touring the parks to make your vacation as seamless as possible. Trust me, I was the biggest skeptic of them all when they debuted but I’m now on the bandwagon and trying to drive it! I’ve found that not only do they make my vacation easier but it keeps me worry free and literally lighter as I’m touring. Let me tell you all the magic they create for you…. Magic bands are bracelets that Disney is using for their Florida parks which serve as an all-encompassing talisman to cover all your vacation needs. Broken down, they are simply silicone bracelets adorned with a Disney head in the center and containing an RFID chip. This chip is linked to your “My Disney Experience” account which holds all your vacation information. These are intended to be worn for the entirety of your vacation and are also envisioned to make vacation easier for the visitor. They are given to each guest at the resorts and each annual pass holder. For day guests (those visiting but not staying in a Disney resort), you can buy the bands at the ticket/will call booth or online at the Disney store. Prices range from $12.95 – $20.00 or more. The plain colors are the cheaper bands and the limited edition bands with Disney designs are the more expensive at twenty dollars. You are NOT REQUIRED to buy a band if you are a day guest. Day guests may use their tickets in place of the magic bands; however, they aren’t as convenient or easy as wearing something on your wrist. Any guest who visits the Disney Resort in Florida could need them. Resort guests MUST have them but day guests have the option of having them. The Disney resort in California does not use magic bands at all, so they are not required or needed. Magic bands are much easier to keep track or and much harder to loose – they are strapped to your wrist. It seems like the magic bands have more functionality than the tickets themselves. You can now scan the band at the resorts instead of producing an ID for your restaurant reservation and it instantly produces your reservation for the security guards. Speed – instead of producing a ticket for each child at the fastpass station, just have them each tap their band. Magic bands are pretty indestructible – they’re waterproof, they stay put, and they scan reliably every time. Two types of guests get these for free: resort guests and annual pass holders. Most of my readers are going to be resort guests, so I’ll focus on those guest types for this part of the post. When staying on Disney property, each stay grants you one free magic band. If you stay multiple times at a resort, you get multiple bands (one per stay). This is why, as a DVC member, I have around 10. All my bands are linked to the same account, so I can use any of them to get in the parks and to serve all the functions I need. Disney does not deactivate old bands and replace them with your new band when issuing a new one; so they all work and you can keep them all. It is for this reason that you only need to stay on Disney property once to get a free magic band. So, lets say you stay on property at a value resort once; this gives you one free magic band. As a day guest in the future you can then use that magic band to get in the parks in the future. If you have never stayed on Disney property and don’t intend to, you can still buy them at the ticket booths and online. They do sell special edition magic bands that are decorated with characters, or logos; these are available on property at the stores. I do have one of these which is decorated in the haunted mansion wallpaper pattern. It’s sold in the Momento Mori store near the Haunted Mansion Ride in the Magic Kingdom. These special edition magic bands also sometimes make special chime sounds when scanned, which is a neat plus. Room Key – just tap on your door and it lets you in the room. This is super cool because you don’t have to keep up with the key anymore – it’s on your wrist! Charge card – No worries about loosing your band and someone charging to it. Disney has you set up a PIN number when you arrive and whoever has your band MUST know this pin to use the charge functionality. This is similar to how you use a debit card. This is super cool though, think about going to a water park and putting your wallet in the locker; your band is always on your wrist and there for you to pay with. Gate Key – all Disney resorts are gated and the band lets you get in to the gate without having to go through security. Park Ticket – You tap your band and scan your fingerprint to get in the parks. Fastpasss Plus entry – Your magic band gets you on the rides which you have set up fast pass for. Disney’s Magical Express Entry – The magic band is your ticket to Disney’s magical express which takees you from the airport to your resort. This is why they recommend you put your bands on in the airport (and pack them in your carry on). Extra Magic Hours Entry – During extra magic hours, they scan your band to ensure you are staying on a resort before allowing entry to rides. Photopass Link: The photopass photographers scan your band after taking your pictures at the parks and then when you go online at night, your pictures are magically there! You can also scan your band at the rides where your picture was taken to ‘claim’ them. Some rides will automatically detect your band while you are on the ride and then link your pictures that way (i.e. tower of terror, seven dwarfs mine train). Disney Dining Plan Payment: You pay for your dining plan meals with your magic band. The waiter/waitress will scan your band and that will deduct your credit. You can also put the gratuity on the band with your PIN that you set earlier. Dining Reservation Link: When dining at the resorts, you always have to stop by security first. They now scan your band to look up your reservations and confirm you are indeed legitimately at the resort for a dining reservation. For Day guests, the band doesn’t have charge functionality, but that’s about it. These things are really an integral part of vacation for a Disney property guest. You can see by looking at all the functions above that you really MUST have one if staying on property. After all, if you don’t, you can’t get in your room! Is is passive RFID, so it’s not like Disney knows exactly where you are at all times, but they can track the throughput in the parks and the fastpass plus guests as they are scanning the bands at the turnstiles. This kind of thing doesn’t bother me because regardless, they do track their numbers whether it’s tickets or a magic band scan. Overall, I was skeptical at first, but now I’m a huge fan of the MagicBands. Formerly, I kept up with my ticket by using a lanyard. This could get annoying because I had to take it off and put it back on with every coaster ride since I was afraid of loosing it. I don’t have to do this anymore and I do feel that band helps me save time. You do need some technical know-how to be able to book your fastpasses and reservations online but once you figure it out, it’s not that bad. Besides, the whole “my magic plus” experience (booking everything online or with the app) is a different entity than the band itself though they do go hand in hand. Do they come in different sizes, how do I know it will fit? The bands do not come in different sizes – they are one size fits all. They are quite large to accommodate all wrist sizes. They fit children by tearing off the extra silicone around the colored part of the band, creating a much smaller band. Many petite women find they need to do this as well to fit their smaller wrists. Can I pick my color? Yes, you can pick your color, and add your name to the back of the band (or other inscription). You do all this on Disney’s website. How do I make changes to my band? 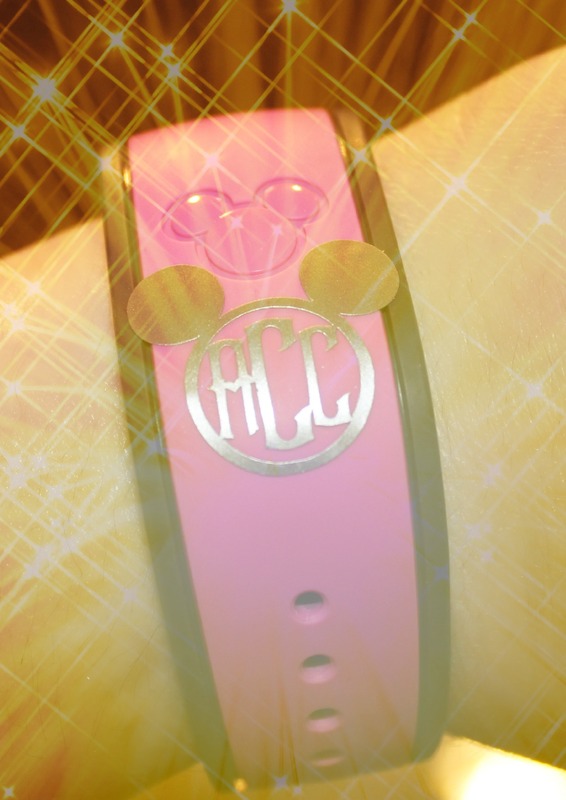 Before your vacation, Disney will ask you to ‘customize your band’ – you go to the My Disney Experience site and then ‘magicbands and cards’ and then customize your band. They will then ship it to your house before your vacation. I don’t wear watches or bracelets, what can I do with this band? Many will loop them around their belt loops or put them in their pockets. I just recommend putting it loosely around your wrist so it’s less bothersome. Also, sometimes wearing a cloth covering over the band helps for those who aren’t used to wearing items on their wrist. Can I put a spending limit on my kids bands? Yes, you can do this at check in or at guest services. What happens if I loose my band? You can go to guest services and have that band deactivated. You will need to activate a new one in place of the deactivated lost band. You can also do this from your phone or a computer, but I’d recommend going to guest services and letting them handle it. What do I do if I have a problem with the band? Guest services can help you with magic band issues. How do I get my magic band when I’m staying on resort? They are sent to you in the mail prior to your stay. What is this fastpass plus you speak of? Fast pass plus is Disney’s system of managing their ride queues electronically, letting guests make fastpass reservations online prior to arrival instead of pulling a ticket while they are there. This requires guests to use a computer to reserve rides prior to arrival and to use the app while there to make additional fast pass selections. The magic band is the way you gain entrance to the rides you reserved via fastpass plus (or ticket for day guests). This is now Disney’s method for managing ride reservations as the old legacy system has been replaced. Can I customize them on my own?